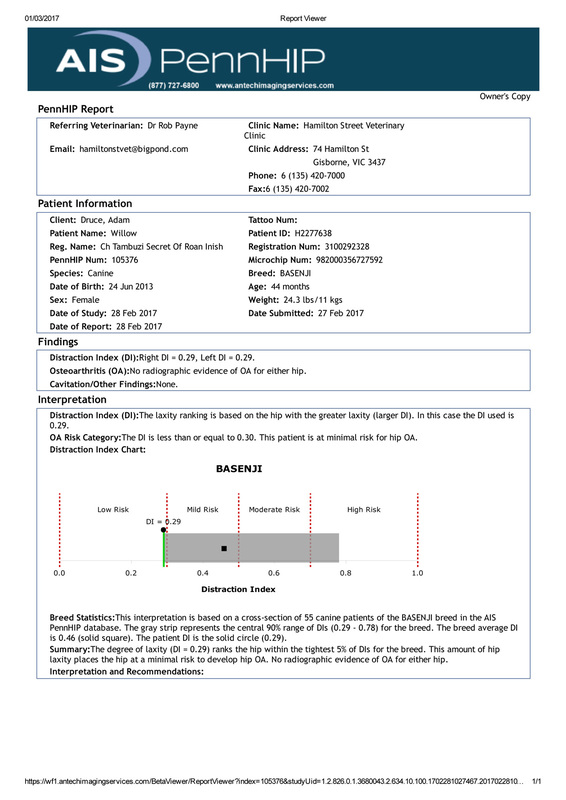 Willow’s (Ch Tambuzi Secret Of Roan Inish) PennHip evaluation report was received last week. Very pleased with her result. Both hips DI 0.29, with no evidence of OA in either hip. Willow’s hips are ranked in the tightest 5% of the breed. The breed ranges from 0.29 (Willows score being the tightest) to 0.78. The breed average DI is now to 0.46. This is disappointing as the average is higher some of the breeds one expects to have higher scores; for example, German Shepherd Dogs have an average score of 0.40, 0.6 lower than Basenjis! I was amazed by the efficiency of the result – the X-rays were only taken one day and back the next from the US – well done PennHIP! Both Willow and Lyra had further eye examinations today. Their eyes have been screened as part of the Tambuzi Health Management Program. An ACES approved specialist conducted the eye examinations. I am very happy to report that both Lyra and Willow received certification that they both have ‘normal’ eyes. There was no sign of cataracts, PRA, coloboma, and no PPMs of any type. It is especially relevant that periodic eye screening is carried out in a breeding program. This is the second eye examination that Willow and Lyra have had completed. I received the following warning from Dr Aine Seavers in relation to Coconut oil and Basenjis. It has come to my attention from clients in general that the internet is currently pushing coconut oil as a treatment – topical and oral – for so many ailments. This oil must not be fed to Basenjis of any age but especially the old and especially in cold weather when we are most at risk of the dogs throwing ‘strokes’ or CVAs. 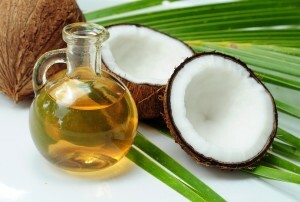 Coconut oil has always been associated with hardening of the arteries and clots – something most dogs are not at risk of – but they can be and I suspect Basenjis do have this problem due to low normal thyroid and high normal cholesterol and haematocrit. The reference below is from the 1970s which shows you how long this has been known but yet ignored by Dr Internet! Halle had a routine ACES eye examination today. Very pleased to report that Dr Robin Stanley’s conclusion was that Halle’s eyes are completely normal with no PPM of any kind. Halle was one of the first Australian Basenjis to be tested by the OFA for late on-set PRA (by DNA analysis) with a normal result. Halle will have one last ACES test when she is 10-12 years old. Willow, Arthur and Raven have been DNA ‘swabbed’ to be tested for late-onset PRA. The DNA has been sent to Orivet for testing. The results are expected in the next couple of weeks. Based on the results of their parents, Willow, Arthur and Raven will have normal or carrier results. 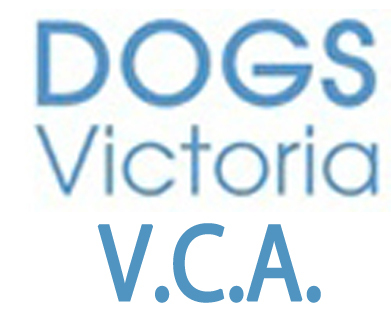 I read with interest the article written by Chris Maxka (SunDiata Basenjis, USA) recently published in the Victorian Basenji Breed Association’s B-Mail about Cystinuria in Basenjis. The article explains that Cystinuria or Cystine bladder stones could be an emerging health concern in Basenjis. Cystinuria is potentially fatal and is found more commonly in Newfoundlands and Labrador Retrievers. To find out more about Cystinuria in Basenjis click on the link below. Cystinuria is a genetic defect. The defect affects the kidney tubules. This in turn affects the kidney’s ability to filter cystine (an amino acid). The filerting process prevents this amino acid from going the urine. When this filtering action fails cystine passes into the urine. Over time crystals and/or stones can form. These stones can enter the urethra and cause an obstruction preventing the flow of urine. This form of blockage is more common in males due to their anatomy. Once there is a blockage the bladder is unable to empty. The bladder is likely to rupture which can be fatal. Cystinuria is congenital in dogs where the issue is more common. Cystinuria is more common in Newfoundlands, Labradors and Scottish Deerhounds. However, it can take many years for the crystals/stones to form in order that symptoms present themselves. Sometimes symptoms do not present themselves. 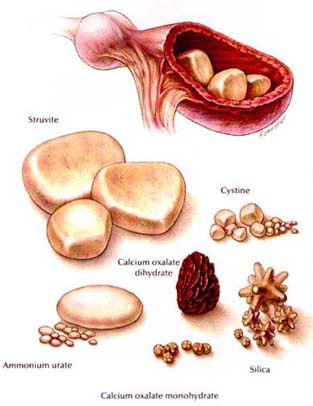 Unlike other bladder stones, cystine stones will generally dissolve or breakdown with treatment. There are some drugs that can be given to try and break down the stones. These drugs are risky and are expensive. Drugs are not typically advised unless there are no other options. Generlly, the stones are removed surgically. In Basenjis the symptoms may present at 17 months-11 years old. Cystinuria has been known in Basenjis for a long time. It is mentioned in the Complete Basenji by Elspet Ford. Although cases are rare this issue seems to be on the increase. The mode of inheritance in Newfoundlands and Labradors is autosomal recessive. However, there is evidence pointing to the mode of inheritance being autosomal recessive with incomplete penetrance. That is a trigger is thought to be required for dogs predisposing of cystinuria to develop stones. The mode of inheritance in other breeds, although thought to be autosomal recessive, is not confirmed. The University of Pennsylvania are researching this issue in dogs and cats. a special diet may be advised. This diet is usually very low in protein which can help reduce the risk of stones forming. Some supplements can also administered to reduce the risk of stones forming. In the case where stones have formed usually the only course is to have them surgically removed. Removal will prevent possible blockages in the urinary tract. When a blockage has occurred a process called hydropulsion is employed. This process pushes the stone back into the bladder. Once the stone is in the bladder it can be removed. Once diagnoses the prognosis is generally good. A change of diet is generally recommended. Further testing might be required to ensure that stones do not form. Once removed stones can re-form so continued observation is required. Cystinuria is being researched at the University of Pennsylvania. Chris Maxka (SunDiata Basenjis, USA) is collating information about Basenjis with this issue. A database is being compiled to assist the researchers. The information being collected includes age and diet of likely patients. Individual information is kept confidential and is not passed to the researchers. Aggregate data is passed to the University of Pennsylvania researchers. If you have a Basenji that has been affected or has been diagnosed with Cystinuria your information may assist the research. If you wish to assist please contact Chris at her email.